There’s nothing like the smell of cinnamon rolls coming out of the oven. In my home, we are all huge fans of the cinnamon roll. And I do mean huge! We like them with pumpkin & pecans, with apples & caramel, in waffle form, as a crust on a pie, & in shortcut form. 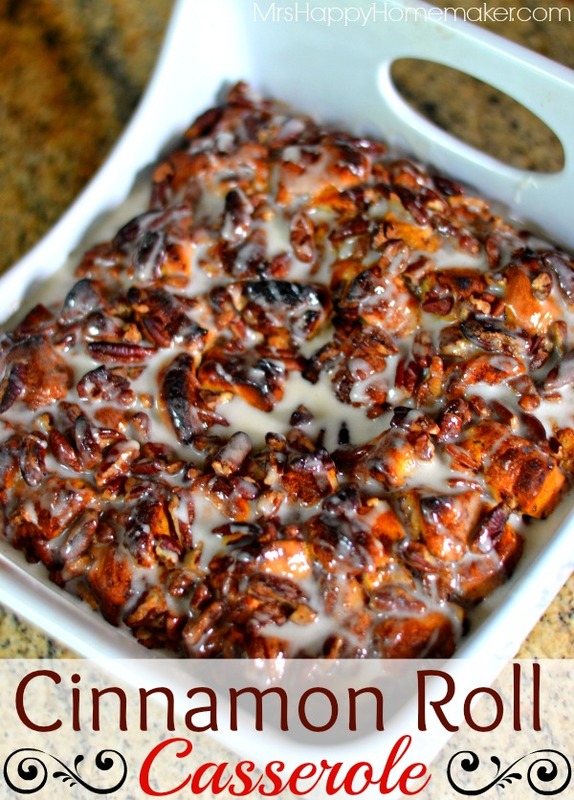 So, why not create something full of cinnamon roll goodness in a breakfast casserole form? Think cinnamon rolls meet french toast. Yeah, you know that sounds heavenly! You can’t beat how easy this is either. You’re gonna want to make this right now. At this very minute. Yes, it’s that good. Pour a little melted butter to cover the bottom of a 3 quart casserole dish. Take your cinnamon rolls (you should have two tubes of 8 each, making 16 in total) – and slice each one into 6 pieces. Lay the chopped cinnamon rolls on top of the melted butter. In a medium bowl, whisk together 4 eggs, 1/2 cup heavy whipping cream, 2 teaspoons ground cinnamon, & 2 teaspoons vanilla extract. Pour mixture over the chopped cinnamon rolls. 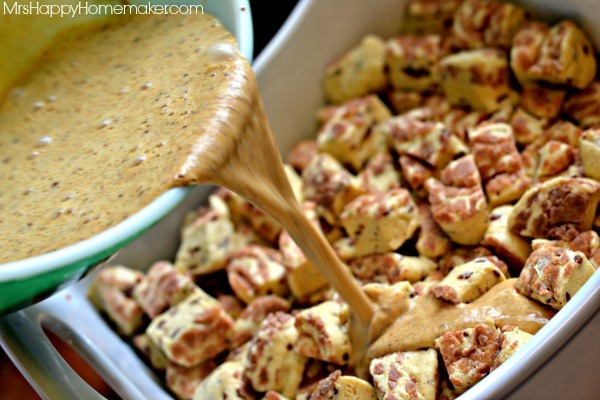 Sprinkle with 1 cup of chopped pecans & then drizzle with 1/4 cup maple syrup. Let cool for 10 minutes. Heat the reserved cinnamon roll icing in the microwave until melted. Stir in 1 teaspoon of maple syrup. 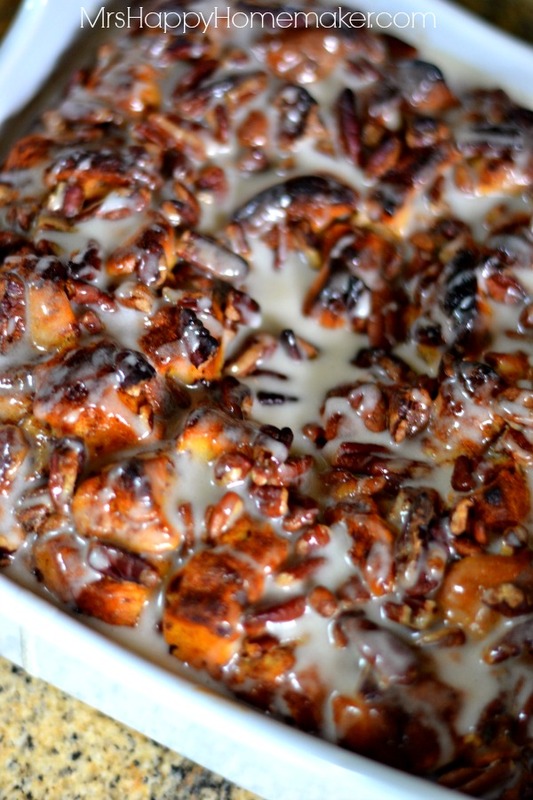 Drizzle the icing over the top of the cinnamon roll casserole. Pour melted butter into a 3 quart baking dish or spray it with non stick cooking spray. Separate both cans of dough into 16 rolls; set icing aside. 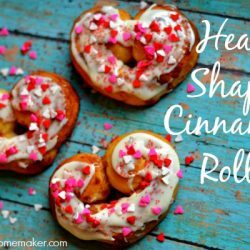 Cut each roll into 6 pieces – place the chopped cinnamon rolls over the melted butter. 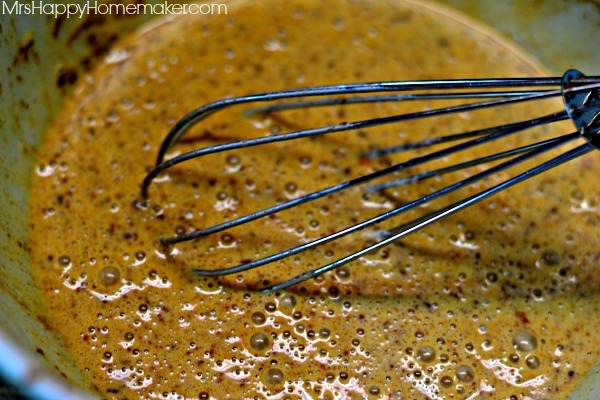 In a medium bowl, whisk together the eggs, cream, cinnamon & vanilla until combined. Drizzle the mixture over the cinnamon rolls. 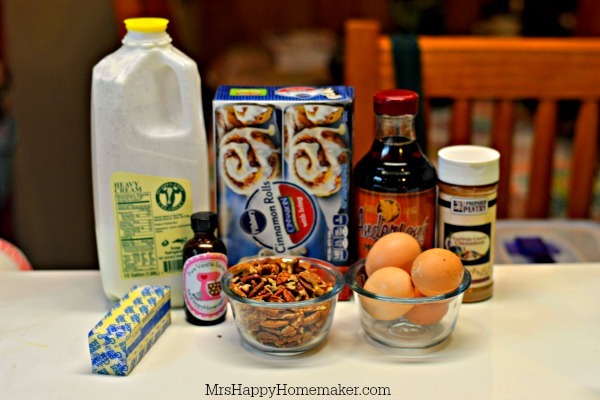 Sprinkle with pecans; drizzle with ¼ cup maple syrup. Bake 25 minutes or until golden brown. Cool for 10 minutes. Remove covers from the icing; microwave for about 15 seconds or until thin enough to drizzle. Stir in 1 teaspoon of maple syrup. 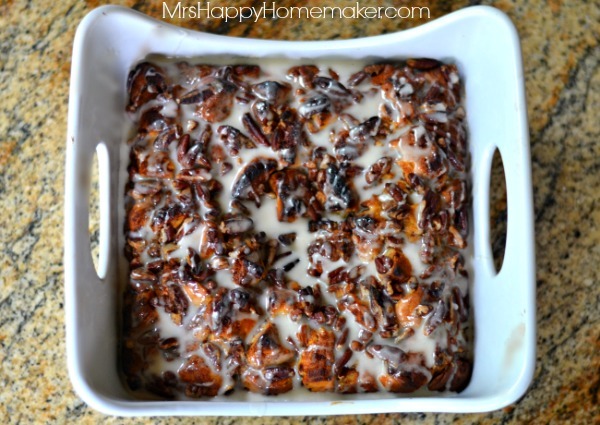 Drizzle over the cinnamon roll casserole. Thanks for this easy breakfast recipe – looks really good! 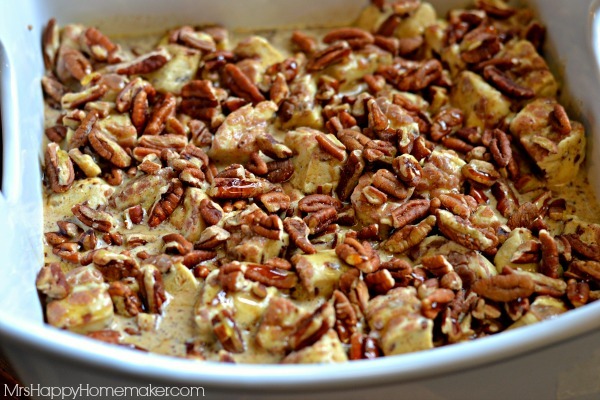 This breakfast casserole looks amazing! This is the bomb! I can’t wait to try this! could you sub the cream for milk? Yes, I’m sure you can. I’ve beenaking this for over a decade. This is from pillsbury. You should at least site them for the recipe. 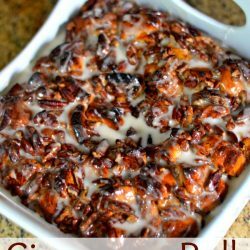 It is adapted from Pillsbury’s Cinnamon French Toast Bake recipe, & it does state so in the recipe box in this post with a link back to the original recipe. Maybe you didn’t notice it, but I appreciate your concern! I try my best to link back to original recipes & inspiration! Can you eat this for a dessert at room temp? I so want to make this! And to try it with egg nog! Hmm, I’m not sure. I’ve never had a soggy issue with mine. Maybe it sat too long before going in the oven – or maybe not cooked long enough… I’m really not sure! Mine too, the top looked beautiful and done but the bottom was soggy and the middle was raw/doughy. The done parts were great though! This looks amazing! I think I might go a step farther and put some chopped bacon on top. Everything is better with bacon, right? Oh man, that sounds GOOD! Great idea! This looks so wonderful. What a great holiday casserole. Making this this weekend for family. I know they will love this. Is this a good recipe to make a day ahead and pop in the oven in the morning? Or will having it sit in the fridge overnight make it soggy? I’ve never tried it like that, so I’m not sure. If you do try it, please come back and let me know how it turns out! No I use this recipe at the restaurant my mom owns and it does great sitting in the fridge overnight! Made this this weekend and it was gone in 15 minutes. Family said ” You should have made 2. Do you think you could make it with raisins in it? I made this a month ago and it’s already been requested again. Will be making my second one in half an hour. 🙂 Thanks so much for this. In fact I love this so much I’m going to throw a link on my blog back to it real soon. 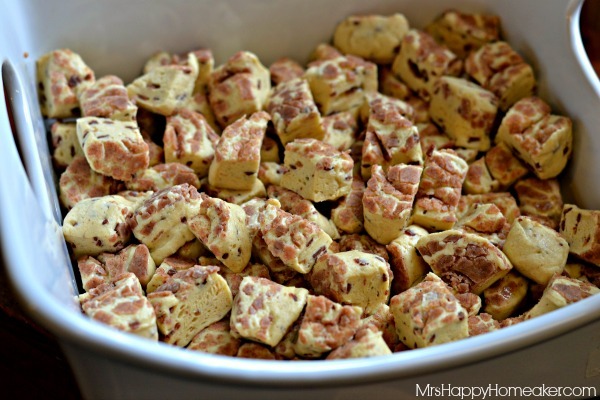 I have made this recipe several times when we have had company visiting. Nothing left over and asked for the recipe. So easy and delicious. I hate that you had that issue! Maybe next time you could try using a longer/wider dish as opposed to a deeper dish. That should get rid of any sogginess. I’ve made this twice, and the middle is always doughy after the cooking time, but the top is brown. Any idea what is going wrong? Thanks? Try cooking it in a more shallow dish – if the dish is too deep, then that could definitely happen as there is not enough room to for everything to cook properly. It’s also very tasty using pie filling! When I make it this way, I spray the pan with ‘Pam’, put desired pie filling on bottom of pan (cherry & blueberry are awesome! ), then cut-up rolls followed by liquid mixture. Super decadent!! 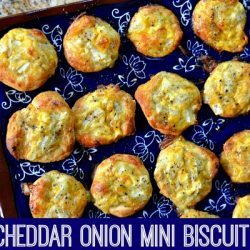 So want to try this for a family breakfast on a vacation, since it looks easy to pull off! Question, though, the Pillsbury version says it serves 12, while yours serves 6. Are you thinking what are actually more realistic size servings? Should I double your recipe if I am serving 6 adults and 3 kids? I added apples. The original recipe was great, but I wanted to add a little something. I used soy milk instead of cream and it was fine. 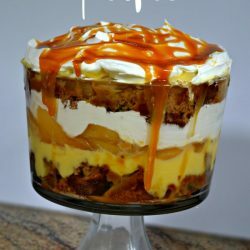 This recipe is so delicious, the maple syrup in the glaze and bread pudding is a perfect match. Thanks I give this recipe a 5 star , easy and delicious. Just made it for Easter brunch, it is fantastic! Needs spiced apples or peaches! ??? ?